Eight persons A, B, C, D, E, F, G and H are born in different years viz., 1975, 1979, 1981, 1986, 1990, 1991, 1993 and 1999. 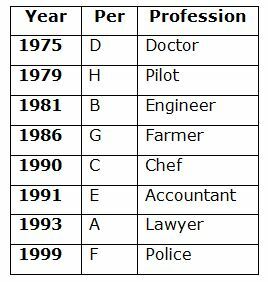 They all are belong to different profession viz., Police, Chef, Engineer, Farmer, Doctor, Pilot, Accountant and Lawyer but not necessary in the same order. Their ages were calculated based on the year 2018. 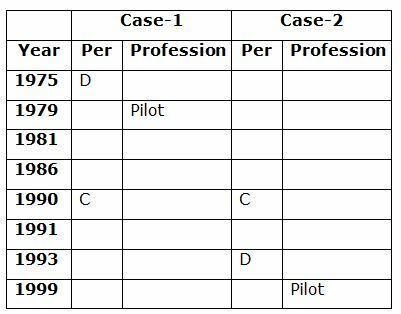 Only two persons are born between the one who is a Pilot and C, whose age is multiple of 7. D was born immediately before the one who is a Pilot. Three persons are born between A and the one who is an Engineer, who is not younger than A. D is neither an Engineer nor an Accountant. The one who is a Farmer was immediately born after B. As many persons born before B is same as after the one who is an Accountant, who does not born in 1981. E was born immediately before the one who is a Lawyer. E does not born in even numbered year. Only one person born between E and G,who is not the youngest person. As many persons born between D and the one who is a Chef is same as between F and the one who is a Farmer. F is neither an Engineer nor a Doctor. 1. What is the profession of H? Only two persons are born between the one who is a Pilot and C, whose age is multiple of 7. D was born immediately before the one who is a Pilot. Three persons born between A and the one who is an Engineer, who is not younger than A. D is neither an Engineer nor an Accountant. The one who is a Farmer was immediately born after B. As many persons born before B is same as after the one who is an Accountant, who does not born in 1981. E was born immediately before the one who is a Lawyer. E does not born in even numbered year. Only one person born between E and G, who is not the youngest person. As many persons born between D and the one who is a Chef is same as between F and the one who is a Farmer. F is neither an Engineer nor a Doctor. 2. How many persons are born between F and the one who is a Farmer? 3. What is the sum of the ages of B and the one who is a Doctor (in years)? 5. If E is related to Engineer and H is related to Lawyer in a certain way. Then, D is related to which of the following? 1) What is the profession of H? 2) How many persons are born between F and the one who is a Farmer? 3) What is the sum of the ages of B and the one who is a Doctor (in years)? 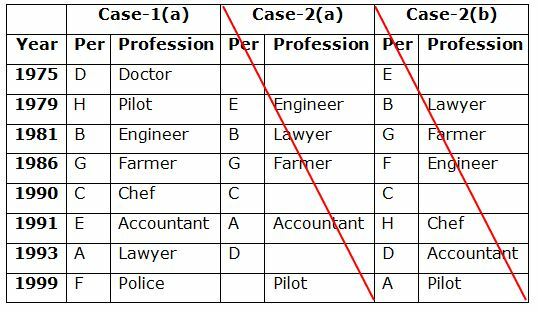 5) If E is related to Engineer and H is related to Lawyer in a certain way. Then, D is related to which of the following?